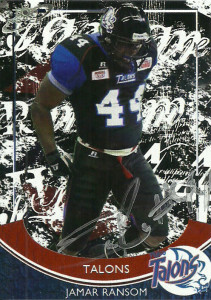 Jamar Ransom was the heart and soul of the Talons defense going all the way back to the franchise’s day as the Tulsa Talons, where he was a member of the Talons 2007 AF2 Championship squad. 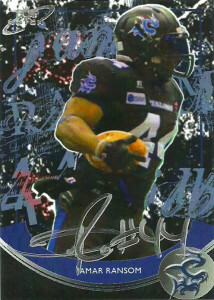 As the ‘Jim’ linebacker, Jamar has recorded at least 50 tackles in each season since the team joined the AFL back in 2010, and over his first three seasons, he was also utilized as a fullback, adding 24 rushes and 11 touchdowns to his name. To top things off, Jamar’s been involved in causing 20 turnovers in 4 seasons. Ransom’s best season came in 2013, when he recorded 70 tackles, 2.5 sacks, 10 pass blocks, 2 forced fumbles, and 7 interceptions for 76 yards and count ’em- 3 touchdowns, earning him AFL first team honors. He garnered quite a reputation around the league as a punishing enforcer with a hard hitting and relentless style of play. The Talons in turn promoted him as their defensive leader with jersey sales. Ransom had been a dodgy guy for me to track down. Jamar not only skipped the season ticket holder event- he wasn’t even available for the Talons game against the Barnstormers. Luckily after the game against the Voodoo, I tracked him to the autograph tables and pushed my way into him. When I gave him his card, Jamar was absolutely estatic. He told me that he had never had his own card before, and clasped the two cards I had created of him as though they were a cherished toy of his. He gleefully signed the two cards for me and it was very obvious I had made Jamar’s day. It is moments like those that I truly cherish. Jamar later got in contact with me asking for a few new customs. I speced out some ideas, but I did not hear back from him. The Talons in the meantime went on hiatus for 2015.